This was a difficult theme for me. Not because it is hard, but because in some ways it is too easy. Creating a new drink by subbing one ingredient for another is how I, like countless others, began my journey into inventing my own drinks. Usually I found that my greated substitutions had been discovered long before I tried them. I’ve even reversed engineered a classic or two by starting with the twist, not knowing it was a twist, and figuring out what the drink started as. I was tempted to write up the Black River Sidecar, a drink of mine that won an early TDN. I had linked to Rick’s great writeup of the drink when he posted it (my prize for winning), but had never posted the recipe here. But I realized I’d never be able to match his funky garnish, and decided I wanted to try something new. A drink I’m finding remarkably versatile is the Negroni. Initially it seemed to me that this combination of Campari, sweet vermouth, and gin would be hard to tinker with, working largely on its marriage of specific flavors. 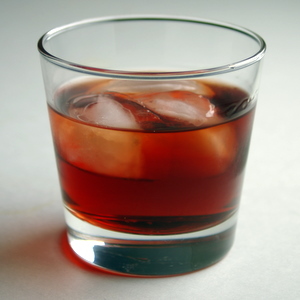 Many experiments with it involve subbing another amaro, such as Aperol, for the Campari, or a different aromatized wine, such as Punt e Mes, for the sweet vermouth. Then I discovered the Agavoni, which trades the gin for tequila, and creates an equally delicious, if very different drink. Since I was able to participate in TDN Mount Gay XO at Vessel, I still have a fair amount of my bottle left. I realized that it, too, might have the strength to stand up to Campari and sweet vermouth. And so it did. And so I give you the Rumgroni. The molasses and oak from the MGXO are surprisingly dominant on the nose. This is a much drier drink than either the Negroni or the Agavoni. I might be tempted to add a little honey mix next time. What’s your favorite variation on a cocktail classic? Check out the roundup of the opinions of this months Mixology Monday partipants over at The Wild Drink Blog! You always makes so nice drinks with Campari, i reallly enjoy them! adding honey-mix sounds also very deliscious, i like how honey adds a new dimension to drinks. Finally tried this drink tonight. So. Good. I wonder what it’d be like with a punchier rum? I bet Aperol would have worked magic with the Mount Gay XO too. Just tried this same recipe on my own with trader Joe’s “whalers rum” a spiced dark rum comparable to myer’s dark rum, and it came out great. I love gin but have sometimes find the negroni and its less popular cousin “the boulevardier” a little medicinal, but the spiced dark rum adds a little sweetness and a new flavor that matches the powerful sweet vermouth I used, the indomitable carpano antica, and of course the Campari really well. Gives the whole drink a smooth after taste. Who ever tasted the gin in a negroni when you’re using Carpano Antica anyway?